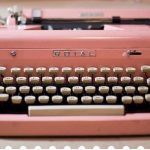 In Part two of our styling a marquee series we look at the theme of the Vintage Tea Party. We’ve seen a real growth in the popularity of couples getting married later in the day and then serving high tea instead of a traditional wedding breakfast. Team this with evening food such as “hog roast rolls” or “fish and chips” and you’ve got a fabulous English feast. Here’s our five top tips to help you plan the perfect marquee tea party. Choosing your marquee style will impact on the atmosphere. 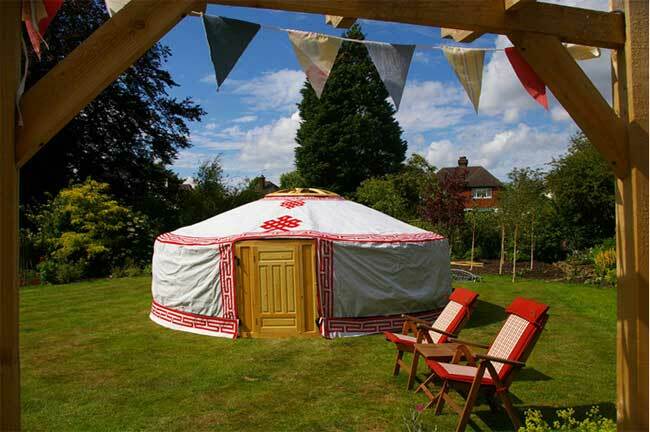 To create that vintage vibe go for a traditional canvas pole tent. To seat around 150 guests (with room for dance floor etc) you’ll need a marquee size of 12m x 18m and don’t forget to add a catering tent too! Add window walls to give you the best view from the marquee and add bags of natural light. Seating your guests at long tables will add to the “village hall” atmosphere or you can have round tables to make things feel more intimate. Depending on how long you need your guests to remain seated there are various options to choose from. Pick Chiavari chairs with seat pads for a fairly comfortable option or wooden chairs for a wonderfully vintage fete feel. When high tea is done and dusted having a lounging area in the marquee really adds a laid back kinda cool. Borrow the contents from your Nan’s house or for an easier option try Vintage Style Hire. Lots of marquee companies now provide marquee linings which lend themselves nicely to adding a splash of colour without over powering the theme. It will also save you lots of extra styling. Ask your marquee company before you book if they have lining samples. Wooden flooring adds to the vintage feel and looks pretty special if the budget allows, if not try coil matting which is a great alternative. Whether you feel like bunting and jam jars have had there day or are here to stay, you can’t really do tea party without them. Whether you make your own bunting or source from a bunting expert make sure you have enough. It might seem like alot when it’s stored in the corner of your lounge but when you hang it in the marquee it won’t seem quite as much. Measure, measure, measure and then measure again. Same goes for jam jars. If you are not sourcing from your florist but collecting yourself then start now. It takes an age but it’s worth it when you can group them together to make cute little vintage arrangements. Everyone knows that pretty vintage china table settings work really well for a tea party. We love Alice and the Teacup for beautiful designs and a great service. Don’t forget the lighting as the sun goes down. Those jam jars will come in handy now as tea light holders which can be dotted both in and around the marquee. Tall candles in old bottles also work really well to give extra light vintage style. And if you want some easy to manage outside seating try hay-bales covered with linens and lace. 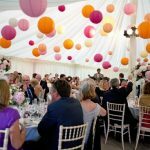 If you’re having a marquee wedding one of the biggest worries for couples is definitely how to decorate it. Over the next few weeks we’ll be bringing you some style advice on some of the more popular themes. Part 1 is bringing the party Island of Ibiza closer to home. Synonymous with sunshine and celebrations galore inject some of that laid-back Balearic fun into your big day with a fantastic Ibiza style wedding lounge. We chatted with Jo Morris of Rio Lounge Boutique Furniture hire who gave us some of her expert advice on how to create a wedding theme that brings with it full on Mediterranean charm……. Your choice of furniture will really add to any theme so go for modular rattan furniture in the classic colour of Ibiza, a stunning brilliant white. Dress with scatter cushions to add a pop of colour (why not use your wedding palette), creating comfort and softening the look. Don’t forget the all important chill-out area where your guests can take a breather from the party and catch up with one another. You can do this in a quieter part of the marquee which is sectioned off from the main area, in an adjoining section or if it’s sunny you can always take it outside. Nothing says Ibiza like a chilled glass of Champagne so keep it nice and cool with classic champagne buckets dotted around your bar and lounge areas. Make sure you have a plentiful supply of ice for guests to add to those summer cocktails too! Daybeds are an absolute must. They’re a really unique way for your guests to chill out and enjoy each others company. Chat and relax on a Miami day bed; soak up the sun on a Mykonos day bed; or get match-making with the Antibes double day bed! White director’s chairs are simply gorgeous for the dining area. They are just so evocative of summer days and you can almost hear the Med lapping on the shore! Comfortable and practical they really add a sense of sophisciation. Don’t forget the poser tables and bar stools as well, so your guests can mingle near the bar and dance floor adding to that fabulous party atmosphere. Ibiza really comes to life after dark, so don’t forget the lighting for when the sun goes down. Lanterns create a great atmosphere outdoors and simple coloured lighting really makes the theme rock. Banish the British climate in the evening by adding some patio heaters to keep guests enjoying the outdoors as long as possible. Thanks to Jo for her help and advice in creating that very cool Ibiza vibe. I’m off to pop the Cafe del Mar remix on the iPod….. If you’re struggling to find a venue that suits all your needs or you have some space but no roof over your head then marquees are a really flexible option for your wedding reception. With yurts and teepees added to the mix the humble marquee has come on in leaps and bounds giving you more to think about when booking. The traditional marquee has the canvas as part of the structure and needs guy ropes to hold it up giving it a more vintage feel and is great for tea party or village fete themes. The frame marquee is more structured and relies on the frame to hold it up giving it a structured sleek effect. It has the added advantage that you don’t need to account for space for the guy ropes. The frame marquee offers the option of window sections and wooden doors to make it feel more like an ‘event room’ and let in natural light. Another option is the Clear span marquee which are made of aluminium box sections but are only really used when the marquee is over a certain size and is likely to be there for a while. Yurts, circus tents and Teepees have been growing in popularity over the last few years and are great for a festival theme. Many can be joined together to form large spaces or ‘lounge’ areas for a bit of peace and quiet away from the main wedding party. Fabulous as well if you want wedding guests to be able to camp overnight as many companies hire out small versions for big sleepovers. When deciding on what marquee to go for you’ll need to know how long it takes to put up and dismantle and work this in with any ground hire fees (unless it’s your own land of course!) plus a schedule of timings for all suppliers. Caterers will need to provide information about plug sockets and any electrical requirements they have so the marquee company can provide the correct generator and right amount of plug sockets. You’ll need to be clear on your layout plan so the sockets go in the right place and you don’t have a mass of leads trailing all over the marquee. If you’re having a DJ or band you’ll need to factor in electrical requirements for them as well. Ideally your marquee should go on the flattest surface possible. Check for bumpy surfaces and don’t put your bar or cake table on uneven ground otherwise you might lose your top tier halfway through the ceremony! Remember to account for access – is the site easily reached for workmen and vehicles? Also consider what flooring and furniture you will need. Carpet and wooden dance floors are the favourite option but make sure your supplier leaves you a hoover. Once all the set up has been done it’ll need a little spring clean to make it wedding ready. Consider if you need heaters – there’s nothing worse than freezing wedding guests and if the weather turns a bit chilly you’ll be surprised at how cold marquees can feel even when packed full of guests. If the marquee is in your garden you might not have enough toilet facilities in the house to accommodate all your guests. Portable toilets are a great option but you’ll need to consider access, plus who is going to make sure they are kept clean during the day and top up those toilet rolls! 6. I can see the stars from here! Popular across the pond “clear -roof” marquees are now making an appearance in the UK. They look similar to a large elegant greenhouse and are fabulous for summer weddings where you can enjoy the light evenings safe in the knowledge that you’ll stay warm and dry inside if the heavens open. These are slightly more complicated though in that they will get hot if the sun shines so you’ll need to make sure guests don’t eat directly under the clear section and that any dance floor is covered over until the sun has started to set. Marquee companies will be more than glad to sit down with you to work out what options are suitable for you. You’ll need to be extra organised if you do want to manage your own marquee hire as you are essentially recreating a venue in a field! Just be clear about what you need from the outset and have a good budgeted plan. This was one wedding video I couldn’t wait to see as it showed all the bits I missed when we worked at Vijay and Leanne’s wedding in the summer. Whilst I was busy up in the marquee Joanne got to see the happy couple exchanging their vowels and ….awwwww….how happy do they look! We’ll be featuring the full wedding with all it’s fabulous details next week but for now enjoy the video, shot by Padgham Productions. If you are still looking to book your venue and have a wedding date between 1st October and 31st March then you might be in luck. Country House Wedding Venues are offering 10% discount on venue hire between those dates in any year! 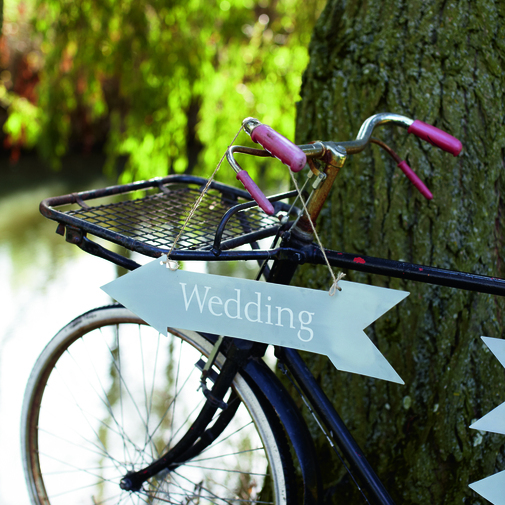 They have two venues in Kent we really like and which might just make the perfect backdrop to your country wedding. Set in a fantastic Sevenoaks location and built in 1728, Combe Bank’s fabulous grounds, grand front door and elegant style make it feel spacious and light. The Adam Room is licensed for civil ceremonies of up to 60 seated guests or 100 guests with 40 standing. 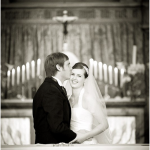 The Chapel is also licensed for ceremonies of up to 140 guests and may be used for a blessing. For receptions the Dining Room can accommodate up to 140 guests with the Main Hall the perfect location for the evening party as it comes with it’s very own stage. The marquee can hold up to 300. 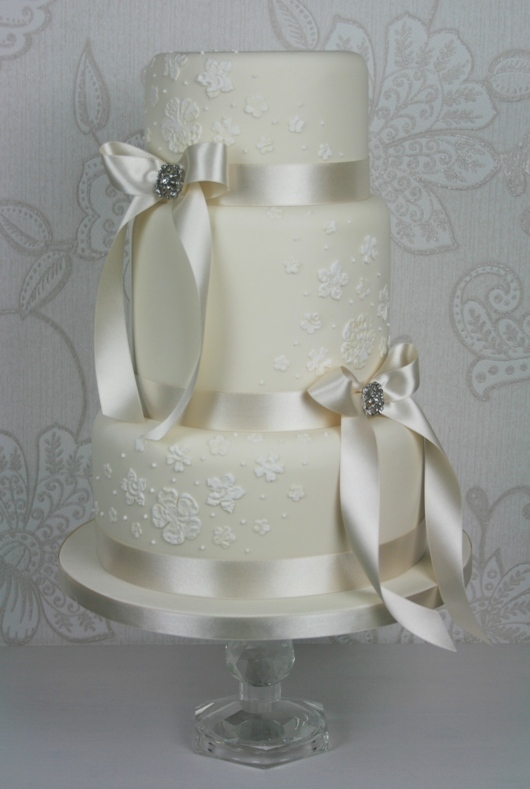 One of their other Kent venues is set in an area of outstanding natural beauty, just outside Maidstone. Boxley House, is a beautiful 17th Century Jacobean Manor and has three main function rooms for you to choose from. The Garden Room and the Terrace Suite can both be used for the Wedding Breakfast with access out onto the terrace and 17 acres of parkland! 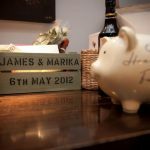 It has a license for Civil Ceremonies in the Drawing Room for up to 50 guests and the Terrace Suite for up to 80 guests. There’s also the marquee which seats up to 300. Both venues would work really well in these traditional “out of season” months as they would look stunning dressed up for a mid-winter ball theme! Go take a look for yourself by booking a viewing with the team. For all your wedding shopping needs on this Olympic Saturday take a look at Pearl and Earl. The online shop is packed full of party accessories and ideas for DIY weddings. They’ve got a great selection of decorations from patriotic red, white and blue if you fancy supporting Team GB or paper hangers and pom poms galore for a gorgeous vintage tea party. 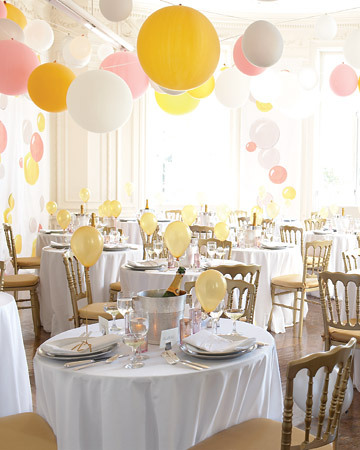 Last week we featured big balloons as an idea for a cheap and effective way to decorate your venue, it was a big hit so you’ll be pleased to know they’re available at Pearl and Earl too. This weekend brings us sunshine! And about time too. With school out for summer and weddings galore over the next few weeks we need the sun to stick to around just for a while. On a selfish note as well I’ve bought loads of maxi dresses for going to weddings and not got to wear them once yet – having to stick to my winter attire made up of tights and a waterproof mac! So before I run away with the sun celebration let’s look back over the last week on the blog. 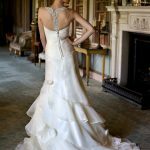 Our dress of the week was by Alan Hannah, a gorgeous backless dress with stunning detail, that judging from the comments we’ve had is a big hit with all of you too. Then we shared with you a unique venue that we’ve had the pleasure of working at, Nettlestead Place. The house, gardens and stunning views along with it being exclusive to you on the day are just a few of the reasons to check it out. Next was our fantastic find Little Gems, who make the most gorgeous cakes alongside a vintage ice cream bike with homemade ice creams. We worked with Gemma at a wedding and could see first hand how much the guests loved picking their own ice cream for dessert and comparing flavours – it was a big hit! 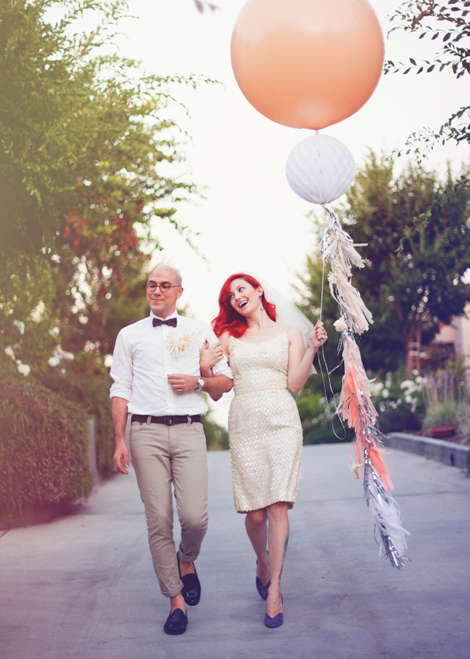 For wedding decor inspiration we looked at the comeback of the humble balloon. 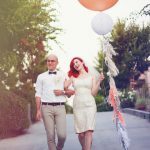 With large latex balloons now in the offering you can make simple and stylish backdrops at a really reasonable price. We just love them. 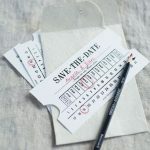 If you’re looking for accessories and decoration for your big day our Saturday Shopping guide is just what you need with beautiful name places, invitations and table settings from one of our favourite online shops, Cox and Cox. It’s our first stop for unique little wedding ideas. Enjoy the sunshine and happy Sunday everyone! 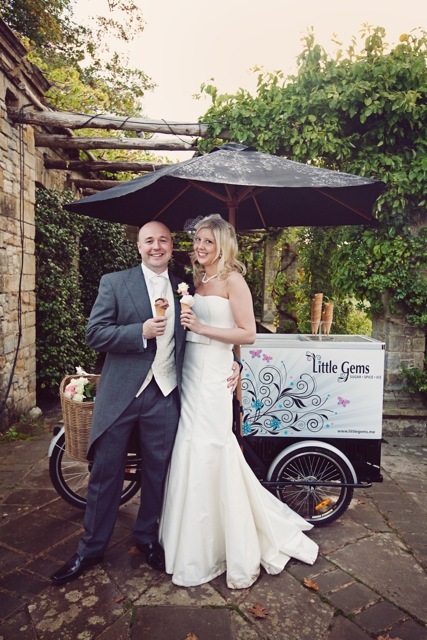 Today we can share with you Little Gems who create gorgeous wedding cakes as well as provide a vintage ice cream bike with a range of gorgeous homemade ice cream to delight any wedding guest – and us! 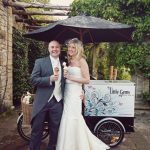 We had the pleasure of working with Gemma at a wedding and so could see first hand how the guests loved picking their ice cream and sharing the flavours with each other. Gemma says of her company “It’s a real family affair and we’ve honed our baking skills over many years all sprinkled with a spoonful of style and a dollop of love! Whether you’re going for a traditional fruit cake, a contemporary fusion of flavours, or ice cream and desserts, it’s imperative to us that not only do they have the wow factor but taste heavenly too. 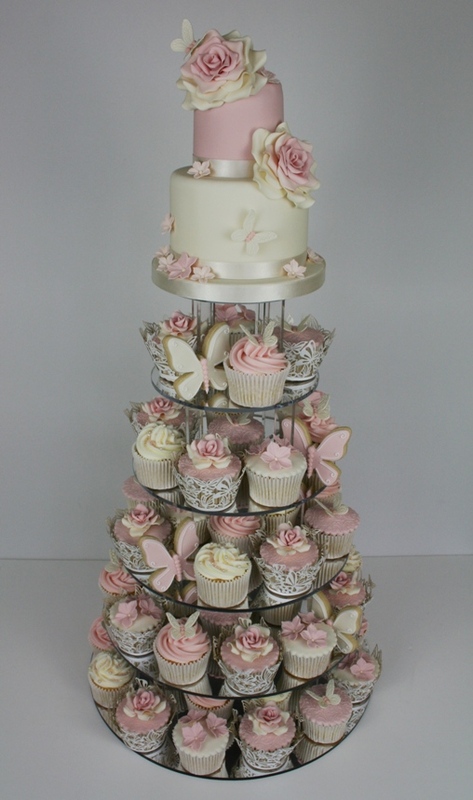 All of Gemma’s cakes are made using the finest ingredients and they can offer a variety of flavours and fillings to suit your requirements. With Little Gems the sweet treats really are endless! 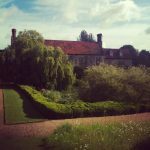 Last month we worked at Nettlestead Place which is a medieval manor house in Wateringbury, Kent. It’s a really unique venue and makes for a rare mixture of formality and intimacy. It is a venue that has exclusive hire so your wedding party will be centre stage. 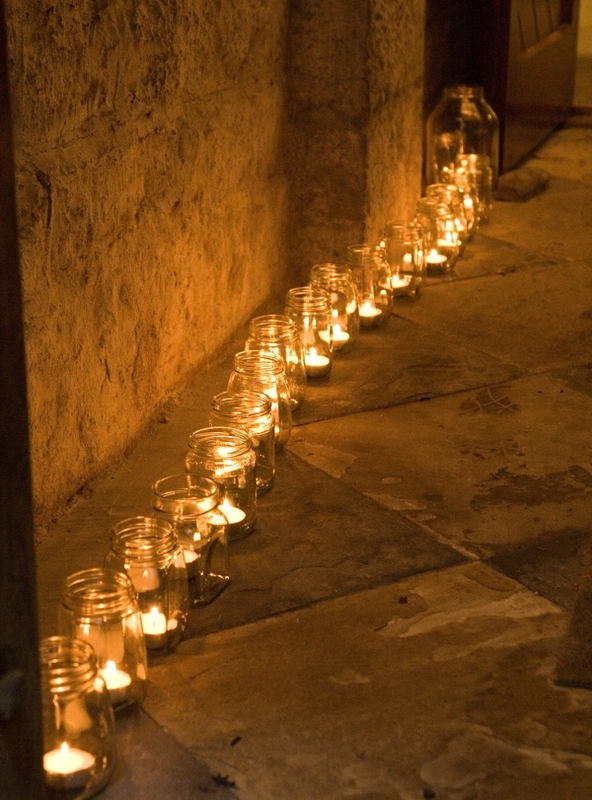 Ceremonies take place in the historic 13th century Undercroft which has a roaring open fire and a very cosy feel. It seats up to 120 guests for the ceremony and up to 45 people for a wedding breakfast. The gardens and terraces overlooking Nettlestead’s large sunken pond make for great photo’s and your guests can enjoy a walk around manicured lawns, hidden rose gardens, paths and water features. Up at the top end of the garden is the marquee for larger receptions (up to 200 people) which has beautiful views right over the Kent countryside. There is ample car parking space in Nettlestead Court Farm or the wedding party can drive down through the medieval gatehouse that straddles the drive. 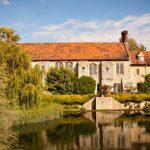 Annabel Tucker lives at Nettlestead Place as well as running it as a wedding venue and so is on hand to offer a flexible wedding experience and will help make the venue work for you. Check out their website for information on prices and view the picture gallery. Decorating your wedding venue with your colour scheme adds a personal touch to your big day like nothing else. 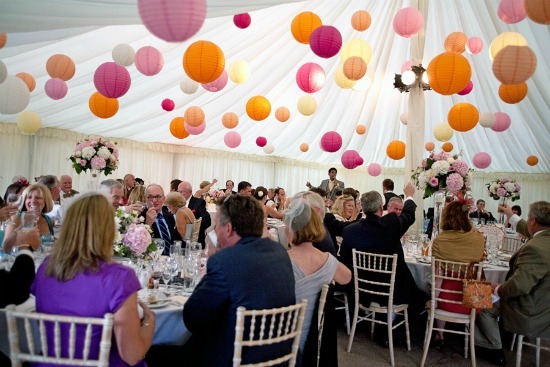 Lanterns and pom poms are a really simple way to achieve a big impact. The phrase ‘the more the better’ definitely applies and grouping them together can really make a statement backdrop. If you are decorating your own marquee, barn or similar type venue take a look at the rest of our board in Pinterest for more inspiration, but here is just a taster of what is possible. 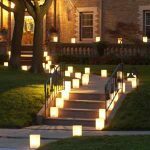 A cheap way of doing mini lanterns so you can light paths and dark corners is to collect jam jars and fill them with long burning tea lights. If you want to have a go at making your own paper pom poms they are really easy – just follow the instructions here from Martha Stewart. To give you an idea of the time involved you can make around 5/6 per hour. Or if you really don’t want to go to the effort of making your own you can buy them online. Paper Poms UK are a specialist vendor who sell the poms on Etsy. Prices start from £2 for a 3″ or 4″ pom. Visit their website for more inspiration on how to use your paper poms.